Adopting the technology wire line coring, the full hydraulic drilling rig driven with rotator, has been the dominant type rig for solid mineral deposits prospecting. It is also the developing direction of drilling technique and drilling equipment in China. It could be used for exploration and prospecting of geology, metallurgy, coal, petroleum, natural gas, groundwater and other industries. The main hydraulic pumps, valves and motors are all selected and put into use from famous international brands. There are two kinds of chassis for your selection and order. One is tyre-traction (with steering gear); another is self-propelled steel crawlers. 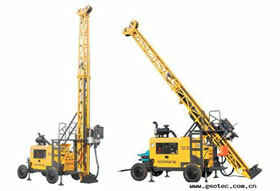 The rig equipped with hydraulic supports; adopting hydraulic cylinder for lifting/lowering. The mast can be folded for its transport and location. With foot clamp touching the earth, the mast could work stably; The hydraulic system adopts load sensitive system;The rig is also equipped with high-position operation platform and operation hole platform (i.e. low-position operation platform). The rotator is fed and driven with a system connecting the spindle and oil cylinder with chain. The system has the function, if the piston rod of oil cylinder moves one certain distance, the spindle will double the distance. The rotator has a long stroke. The rotator is driven by a single motor for its rotation. It is equipped with a four-speed gear shift, and its speed could be adjusted by hydraulic pressure with stepless speed change. Our full hydraulic drilling rig is also equipped with centering guide in its up part and guide in its lower part. A hydraulic clamp is adopted at the operation hole of the lower platform. We are a professional hydraulic drilling rig manufacturer and supplier in China. We have gained the recognition of a large number of clients through our 20 years' production experience and marketing and serving experience, and meanwhile we have accumulated abundant experience in terms of products. At the same time, we keep researching full hydraulic drilling rigs that can better meet the clients' needs and the market. Our full hydraulic drilling rig has been exported to South America, Africa, East Europe, Southeast Asia, and Middle East. We have clients in America, United Kingdom, France, Canada, Australia, New Zealand, Philippines, Indonesia, India, Chile, Brazil, Russia, Algeria, Morocco, Malaysia, Thailand, Pakistan, Mongolia etc. Located in Wuxi, near Shanghai, the biggest port city of China, we are provided with convenient transportations of any kind, by land, sea or air, which will greatly reduce your transportation cost. To meet the clients' different demands, we can provide all kinds of geological drilling tools, such as diamond core bits (synthetic natural), reaming shells PDC bits, core barrels overshot, drill rods. If you need them, please contact us.